This week's theme is: The Kitchen. 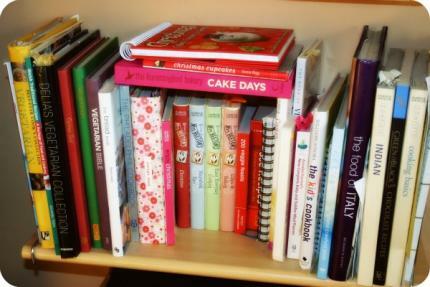 It can be food, or your corner of the kitchen, or something you particularly love in there, your apron, your favourite recipe book. Growing up, we had a tiny kitchen. Little more than a galley, there was just about room for two people to stand either end as long as they didn't want to pass. For a household of six people, it was far from ideal, but as it was located in the first floor extension of a four-storey house which had been converted into maisonettes, there was little room for expansion. When we bought this house I sighed wearily when I saw the size of the kitchen. We live in a 1950s ex-council, three-bedroom, semi-detached house and the kitchen, again, was woefully inadequate in comparison to the remainder of the house. However, we were lucky because we needed to do a fair amount of structural work to the property and so were able to create more space by knowing the hall cupboard and pantry out and joining them onto the kitchen. I love the room now. It's big enough for several people to stand around in and chatter while I cook, there's plenty of workspace and cupboards, and on a day like today the sun streams through the south-facing window and sets the walls alight with am amber glow. Your kitchen aspirations seem very similar to mine and I love the photos especially the one of the boy peering into the oven to check on his cakes. Love those photos. I went from having a massive kitchen at my mums to having a small one now but it's ok for the two of us. I love looking through people's recipe books but the things on their fridges are so fascinating. I can spend ages just looking at everything! I'm off to gaze at yours for a bit now. Lovely photos! My little girl loves to cook, and I think it's v important they learn. I think the fridge magnets tell a whole story of who lives in the house don't you? I love that picture of The Boy looking in the oven….which reminds me that we need a new bulb in ours! 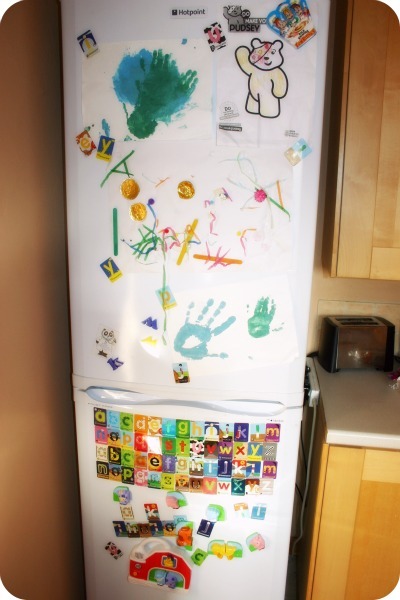 Your fridge still looks more organised than mine! A lovely, family kitchen. I love having a big kitchen, it really does make a big difference. Looks like the Boy is quite the little baker. 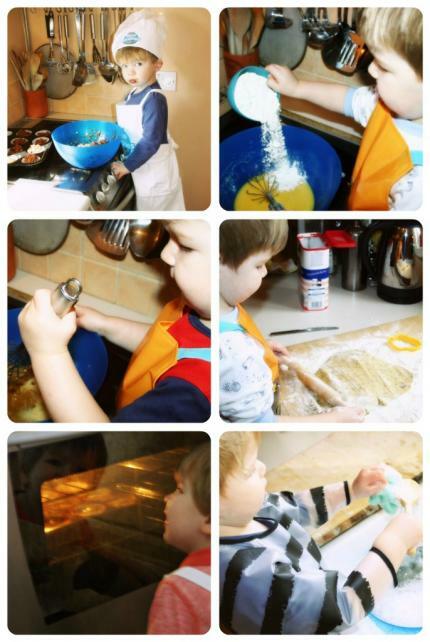 I love seeing pictures of The Boy cooking – I wonder if he will become a chef when he is older? He'd be just like his uncle if he did then! I want him to be capable of making his future wife dinner without being prompted!